If water runs to it or through it, I do it! Anytime you are in need of plumbing installations, plumbing repair or plumbing maintenance, A Expert Plumbing is your go to plumbing expert in Naples, Bonita Springs, Estero and Ft Myers, Florida. As a licensed and insured plumbing company, we are equipped and experienced with the latest techniques and tools to successfully complete any job within budget and on time. Call us for all of your residential, commercial and institutional plumbing needs. Use our plumbing service, maintenance and repair for water heaters, water softeners, well pumps, garbage disposals, toilets, faucets, hydro drain jetting and slab leak detection. If your water heater is not heating the water properly or is leaking, A Expert Plumbing will inspect your current hot water heater and if it cannot be repaired, we will quickly install a new hot water heater so that you do not have to be inconvenienced with no hot water. We know that clean water is important to you and your family. If your water softener is not working properly or if you do not have a water softener unit installed, contaminents could be getting into your water. We can repair your existing water softener or install one so that you and your family can enjoy clean water. When you rely on your own well for water it is important to keep your well pump running so that you can continue to have water without interruption. If your well pumping system is not producing water or the water pressure is not consistent, contact us so that we can find and solve the problem. If you do not have a well pump but would like one installed, we would be glad to install one for you. A garbage disposal makes cooking so convenient as you can easily grind scraps without having to throw them in the trash. If you do not have a garbage disposal or your garbage disposal breaks, it can be inconvenient. If you would like to have a garbage disposal installed or replaced, call us today! Is your toilet leaking or water continuously running? Do you need a new toilet installed or an old toilet replaced? A Expert Plumbing will repair your current toilet or install a new one. If your pool heater or pump is acting up, give us a call. A pool pump or pool heater that is not running properly can use more electricity. If you do not have a pool pump or pool heater, we can install one for you. A heated pool provides a more comfortable and enjoyable water temperature that can be used all year long. Do you have a leak and not sure where it is coming from? Use our slab leak detection services to find and repair your leak. Let us check out your existing hot water heater and we will repair it if possible. If your heater cannot be repaired, we will install a new hot water heater so you can continue to enjoy the convenience of hot water in your home or business. We will install a new toilet/s into your home or business. We will install a new faucet/s or replace an existing faucet in the bathroom, kitchen, garage or any other room in your home or business. A working garbage disposal makes cooking more convenient as you can easily dispose of unwanted vegetable and food scraps. Call us to install a new garbage disposal in your kitchen. A pool that has an efficient pool pump and pool heater will save money on electric and keep your pool's temperature and cleanliness up to par. Call us to install a new pool pump or pool heater in your residential, commercial or institutional pool area. Backflow can be dangerous and the water you use in your home or business can become contaminated. Contact A Expert Plumbing for backflow testing to ensure your water is not contaminated. If you experience an emergency plumbing issue in your home or business, contact A Expert Plumbing for quick response to resolve your plumbing issue. Contact us for backflow testing and repair. Remodeling your kitchen and/or bathroom can add value to your home plus create a more enjoyable environment. 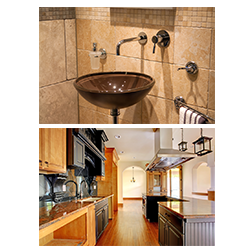 Contact us for all of your kitchen and bathroom remodeling needs. Let A Expert Plumbing solve your sewer and drain problems with our sewer and drain cleaning services. If you have sewer problems call us and we will use our sewer video camera and equipment to view your sewer line/s in detail and see what and where any problems or blockages are located. Copyright © 2013 Business. All Rights Reserved.